Using paper stickers is so past tense. Why not save some space at your workplace, some time and a few trees? Our new socialengine plugin is a modern way to create notes and reminders. Free your fridge, laptop or some other place you used to clutter up with square colored paper sheets. All your notes will be conveniently categorized and placed on one separate page of your site. Have an urgent to-do list? Use our sticky notes! Create a sticky note and it will be displayed either on one certain page or on every page of the site. Admins have an opportunity to take an advantage of one more awesome feature of this plugin. As admin you can create private sticky notes as well as public ones! And there are a lot of opportunities to even monetize your community with its help. 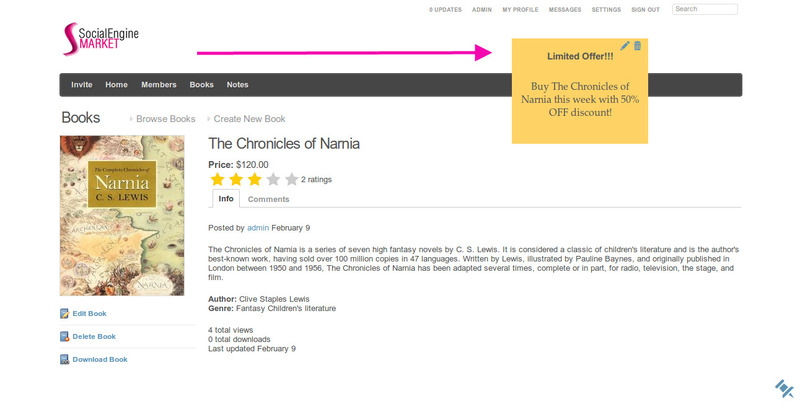 Say, you use our Books plugin and want to sell some book with a special offer or discount. Just place a sticky note with the necessary information on the Book Profile Page, and presto, you have just placed a small advertising widget right on your site absolutely free! This is just one example of how you can use our new Notes plugin but there are much more depending on the subject of your site. Share your ideas of using it or suggestions for improvement and we'll certainly implement them in the next version. Find out more detailed information about SocialEngine Notes plugin in our Marketplace.